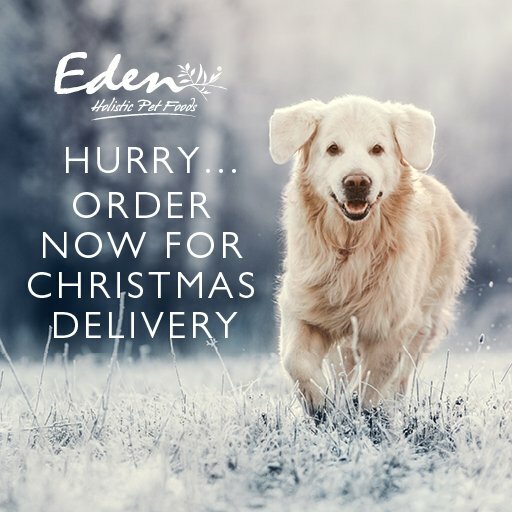 Eden Pet Foods are dedicated to delivering the very best customer service with total satisfaction by making your selection of Eden Pet Foods as straight forward as possible. Once you have selected the products you require from our online store, you can add these items into the shopping cart. They will be held in the cart for you to review until you are ready to complete your purchase. Online payments can be made via most major debit and credit cards or our third party mechant provider, Paypal. There is an option within PayPal to use a credit card or debit card if preferred. Please note, American Express and Diner Cards are not accepted. VAT is charged at the standard rate of 20.0%, this is inclusive to the channel islands. Please note that our working dog range is sold on acknowledgement that you are purchasing food for “working or sporting dogs”, in accordance with H.M.R.C reference 701/15 (December 2011) Item 6.4. Confirmation of your order is an indication that we have received your request for an order. A contract of sale exists between us once we have accepted and completed your order. This term has been included to ensure that where goods are no longer available, when the terms and conditions of sale have changed or we have to amend the order, you are protected and kept up to date on the progress of that order. We will contact you to ensure that you are happy with any alterations made. In the unlikely event your order is received damaged please contact us immediately with details of the problem and your order details. We will endeavour to rectify the issue in a timely manner, however it is your responsibility to notify us of any incorrect goods supplied within 14 days of delivery. Your rights to return goods are protected under the EU Distance Selling Directive and under the UK Consumer Rights Act. Any damages or conerns raised regarding your order will not affect your Statutory Rights. If you change your mind or wish to cancel your order please notify Eden Pet Foods within 14 days of delivery. Once we have acknowledged your request you then have a further 14 days in which to return the goods to the address above. You are responsible for the cost and risk associated with returning goods, as a result we recommend using a tracked delivery service for peace of mind. Our returns policy does not affect your statutory rights. The returned goods do not need to be in their original outer packaging however they need to be in a sellable condition. Return postage is at your own cost and risk. If you change your mind during the delivery process, additional charges will be incurred in order to return the goods. This cost will be deducted from your refunded amount if applicable. Your refund will be processed as soon as Eden is in receipt of those goods, refunds take approximately 3-5 working days to appear in your bank account once processed.